Michael Cisco lives in his own universe — of words. "You can hear my words," he tells us in the prologue to 'The Great Lover' (Chomu Press ; April 14, 2011; $17.50 / £13.00 € 14.50 ; 446 pages), "but you cannot hear the wild gaiety with which I peak them." He's wrong there. We certainly can hear, literally hear, the joy with which Cisco writes. The prose flows, jumps and dances in the rot and putrefaction it describes with precision and poetry. The real miracle is that Cisco transcends the usual pitfalls of weird fiction written in ornate prose. 'The Great Lover' is, for all its prose frescoes and poetic interludes, a pretty straightforward novel, but set in a world so bizarre and intricately conceived that a line of words is in no way the shortest distance between two points. We have then, a contradiction here, and it is not the first that any reader entering 'The Great Lover' will encounter. Cisco wants to immerse us in stories and dreams and rot, to forget the world that surrounds us and enter his world of words. Yet he also takes pains to remind us that we are in his world and that he and his characters are calling the shots. 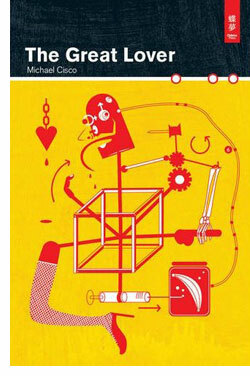 Reality and reading or love and death, Cisco offers readers the unique experience of exploring an underworld of words, of characters who know they are characters, of creations who are aware of their creator. There's a certain literary formality to Cisco's novel, but he constantly undercuts it with genre-fiction japes and tropes taken to an extreme. You'll find mothers who pour flaming blood into the mouths of their vampiric daughters and an ingenious Prosthetic Libido, all rendered in prose that recalls the poetry T. S. Eliot. Cisco is meticulous and intelligent, but his willingness to indulge himself and his readers in wildly-described scenes of fantastic, surreal horror help him deliver an experimental, literary novel that is enjoyably odd. At the center of this is not one character, but three; The Great Lover, our humble narrator, Michael Cisco and the world of words they inhabit, the world they create, one word at a time. There's a real and relentless sense of competition here, and this is the heart of the novel. Each of these characters is competing for the readers' attention. Each hopes the wrestle the readers to the ground and pin them here, in the book. The novel itself is nothing less than a Prosthetic Reality. Given the level of language, and Cisco's willingness to play, 'The Great Lover' is indeed a fine Prosthetic reality.